Albert Einstein (and his first wife) spent intermittent periods in Zurich, with Einstein both studying and working in the city. In fact, such was Einstein’s enthusiasm for all things Swiss, he eventually became a citizen of Switzerland (ultimately prompted by the unnerving prospect of military conscription). Einstein insisted on attending the prestigious Zurich based Swiss Polytechnic University, patiently waiting a year for acceptance having failed his first set of entrance exams. Those with an avid interest in all things Einstein can take a trip to nearby Bern, where the fascinating Einstein House awaits them. Nestled snuggly along the shoreline of Lake Zurich lies Tina Turner’s humble abode. By humble, we really mean luxurious, sprawling and somewhat extravagant – but still beautiful nonetheless. Tina’s affection for Zurich led to her decision to become a Swiss Citizen – understandable given the fact she has lived in Zurich since the mid 90’s. Asked why she had chosen Zurich as a place of permanent residence, Tina told a German newspaper, “I’m very happy in Switzerland and I feel at home here. I cannot imagine a better place to live”. Tina also married her record executive fiancé Erwin Bach in a ceremony close to Lake Zurich in 2013. Marxist Vladimir Lenin spent a year living in Zurich, during his exile in 1916. He lived with his wife, Nadezhda Krupskaya in Spiegelgasse in the old town. It is said that Lenin enjoyed his stay in Zurich, apparently writing to his mother informing her that the lake was an extremely beautiful spot where he and his wife spent much of their spare time. It was whilst living in Spiegelgasse that Lenin completed his work ‘Imperialism: the highest stage of capitalism’ – very appropriate given Zurich’s enduring position as a financial powerhouse. Famous composer Wagner spent time living in Zurich following political unrest in Germany. Wagner was said to have been in a terrible state on arrival in Switzerland, finding enforced separation from the German music scene extremely distressing. Nevertheless, Wagner continued to work within a creative capacity, successfully penning three works during his time in Zurich (‘Art and Revolution’, ‘Opera and Drama’ and ‘The Artwork of the Future’). He also completed most of the libretto of the four operas that are Der Ring des Nibelungen. It is said that Wagner viewed his time in Zurich as a restorative and reflective period in his life – quite possibly due to ill health which forced him to adopt a far slower pace. Today, there are exhibitions held in Zurich throughout the year which pay tribute to Wagner’s life and talent and the city recently celebrated the 200th anniversary of the controversial composer’s birth. Emma Cleverly is now a freelance writer, but before she took to penning articles she had a varied career, firstly working in the travel industry – where she actually spent some time Zurich, working as a Nanny, this gave her a taste for family life and after meeting her husband there, she eventually settled in London to raise her own children and begin her writing career. GUEST POST from Dimitri@Newly Swissed: The „new Zurich“ – what is there to see and do? With a height of 126 meters the Prime Tower is the tallest building in Switzerland, featuring the Clouds bar on the top floor. Expect a wait though as the views on Zurich are quite spectacular. For free vistas which are just as spectacular (in a different kind of way), walk along Geroldstrasse to the flagship store of Freitag bags. The famed tower made of shipping containers provides unobstructed views of Zurichis main terminal and the mount Uetliberg. The views are free, but be ready to climb some stairs to get there! Now that you have worked up a hunger, swing by the latest urban farming/restaurant project next door: Frau Gerolds Garten! Located on a previously vacant lot, this hipster spot offers food, fun and fashion in a cool setting! Back on Geroldstrasse, pass the Freitag store towards the shops which are nestled underneath the viaduct. One end features an urban farming project using a shipping container (duh! ), while the other end houses a bustling indoor market hall. Spend your evening at Sphères, a combined bookshop/coffee shop/performance stage which is within walking distance. Dimitri is the founder and chief editor of Newly Swissed. The lifestyle platform about Switzerland informs expats and tourists about living and traveling in Switzerland, language and culture and Swiss products and services. Read more about Frau Gerolds Garden in post from September 09 and August 16. Audrey is the girl behind “That Backpacker”. She was born in Canada, raised in Argentina, and now finds herself teaching English to a mischievous bunch in Korea. When she’s not on the hunt for authentic Indian curries, she can be found exploring her current home base, and plotting her upcoming travels around the globe. myfriendfromzurich wrote a guest post for her column “There’s A Place In”, in which we listed some must-sees and must-dos for visitors. Read it here. Yeahhh: guest post number four! To do Holly Beckers BYW-class was definitely a good thing to do! Not only did we learn much and get inspired, we also met so many nice fellow bloggers from around the world. Among them Anette from Germany who blogs about the little things in life she loves and also makes her own jewelry. As Anette likes Zurich almost as much as we do, the idea of us doing a guest post for her blog lebenslustiger.com came up easily. Read the whole post here. Graphic and Product Designer Amanda from L.A. shares all facets of her creative interests on her amazing blog LoveCreative: Design, music, books, food, fashion and art. We loved writing a guest post with a guided tour through the home of modern design – Zurich – and hope there soon will be traveling lots of L.A. design students to our exciting city. Find the whole guest post here. Shannon from Wanderlust on a Budget is a California girl who loves to travel and blog about it. She started a new monthly series, Blog Spotlight, in which she features an interview with a fellow travel blogger. And guess who had the luck to be the first one to do the Q&A?! 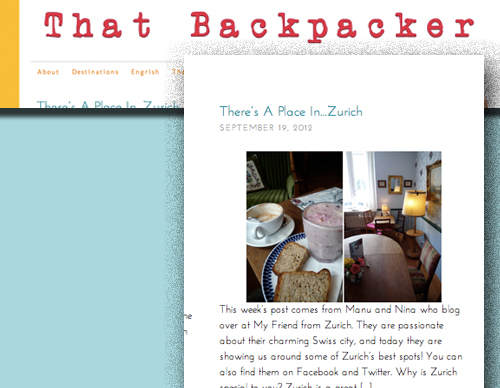 myfriendfromzurich - well actually one half of the two girls behind this blog.